Read our 'Welcome Letter' and learn about the NEW rewards program! Today’s post will address how to generate a solid income from our Affiliate Program in a polite and tactful way. Affiliates are an extension of our company. When you become an affiliate you are representing our brand. At Sigma Beauty, our clients are the basis for all we do and we want them to have the best shopping experience they can possibly have, no matter where it starts. Sigma Beauty stands for quality products and excellence in customer service. As a representative of Sigma Beauty, we hold you to the highest standards. There are polite ways that you can effectively share your affiliate link and generate sales. Passive sharing is one of the best strategies you can use. Examples of passive link sharing include blog banners and the addition of your affiliate link in a permanent section of your social network of choice, such as your profile or bio information. You can also make your affiliate link a permanent component of your YouTube information box, right along with other links you share in every video, such as links to your blog or website. These are respectful ways you can passively approach your potential customers. Spamming your potential clients will only drive them away. Besides using your affiliate link in a banner format, permanently sharing in your profile, bios, or YouTube info box, you can always occasionally share your thoughts about a specific product or exciting news on upcoming or new Sigma Beauty products and include your affiliate link. When you share relevant and interesting information occasionally, your potential customers are more likely to pay attention, be interested, and ultimately click on your link. Again, moderation is key. You do not want to drive your potential customers away by repeatedly addressing the same subject in your social networking sites. Being honest and genuine with your viewers and followers is always the best approach. They will appreciate your honesty and you can ultimately build a great relationship based on trust. Keep in mind your own shopping behavior and experiences when formulating your affiliate program strategies. If an action seems exaggerated or pushy to you, this is likely how it will be perceived by your customers. Be smart, respect your viewers and followers, and enjoy all that the program can offer you! Thank you for joining the Sigma Beauty Affiliate Program! Think you are a classy and respectful affiliate? 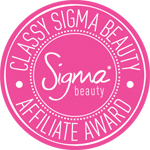 Apply to receive a $50 gift certificate and the ‘Classy Sigma Beauty Affiliate Award' badge! We will review all entries and select a winner every month!